Assay Office Birmingham has invested heavily in the latest technology to enable marks to be applied using laser technology. This is particularly suitable for hollow or imported items where customers do not have the opportunity to finish an article after hallmarking. There are now two styles of Laser Mark available: - an outline or incuse mark, and a relief mark which is similar in appearance to a traditional struck mark. Very useful for marking hollow, finished or intricate jewellery products, where a punch mark is undesirable. Suitable for larger marks on finished or semi-finished products particularly where a display or feature mark is used. It is already popular on money clips, key-rings and silver giftware because it is now possible to produce a feature mark without any bruising or distortion at precisely the required size, position and depth. Combining the skill and techniques of a highly qualified team of laser hallmarking experts with the very latest laser technology, we specialise in laser marking across a wide range of products. Be it a corporate event, sporting event or a personal event such as wedding or christening, a personalised laser mark is a lasting reminder of an occasion or achievement. A personalised message turns any product into a special gift. 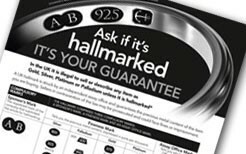 Prices and quotations are available on request for both hallmarking and non-hallmarking applications. There is a one-off charge of £50 + VAT to prepare your unique sponsor mark for lasering and any personalisation or branding, will be priced on application. If you have any queries or questions relating to our Registration process, please contact our Registration Clerk, Lin Moran on 0871 871 6020 or you can contact us here.